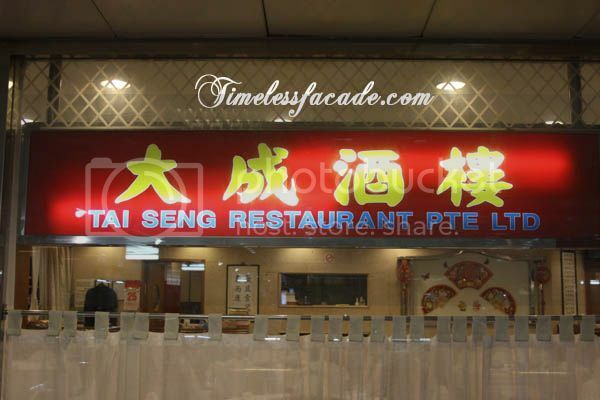 Had dinner with a couple of my relatives at Tai Seng Restaurant, one of the long standing traditional Teochew restaurants still around in this era of fast food and modern Chinese cuisine. Established in 1933, it used to be located at Outram (if my memory serves me correctly) and was apparently very popular back then. 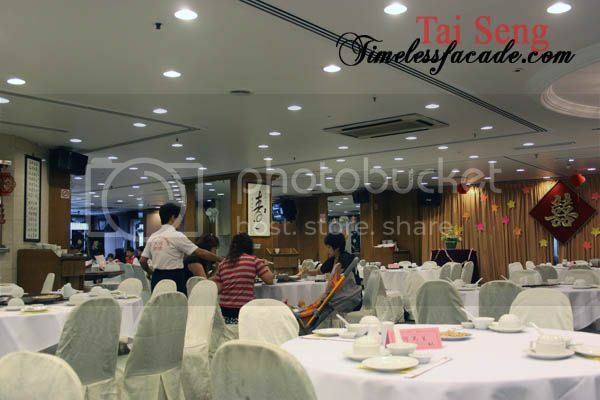 Currently located not too far from its original location, on the top floor of People's Park Centre, Tai Seng looks just like your typical nostalgic restaurant from yesteryear. Think Red Star or Yan Palace. Our dinner trotted off to a good start with the prawn roll or Har Zhor, which was crisp without involving too much oil or fatty meat in the equation. Dipped into the plum sauce, it was a nice blend of sweet and salty. 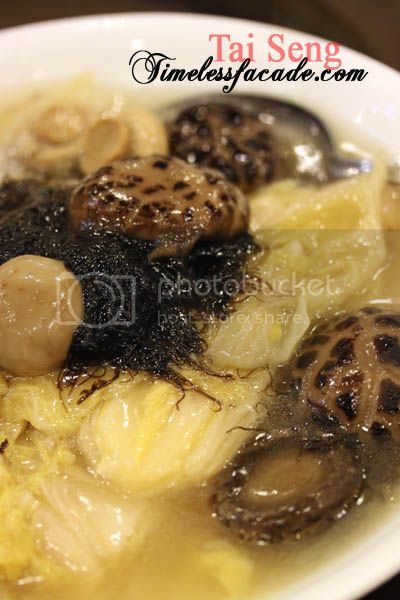 A traditional Teochew dish, the braised cabbage isn't exactly my cup of tea because of the way it is prepared - very soft from being soaked in the gravy. But that's just a personal preference. My parents liked it though. I loved this dish for its flavour - salty carrying a hint of spiciness and its crisp and dry texture. 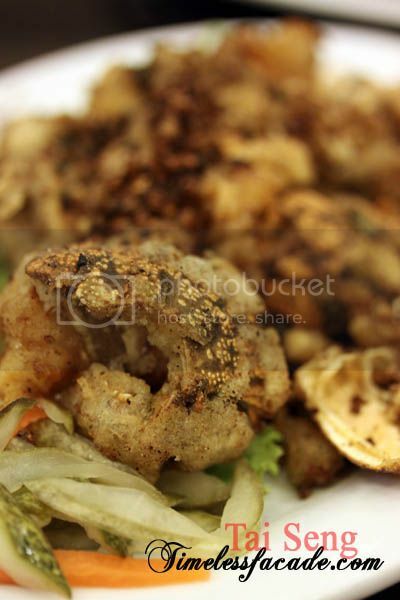 The presence of fried garlic provided a whiff of fragrance as well as the nice garlicky after taste. 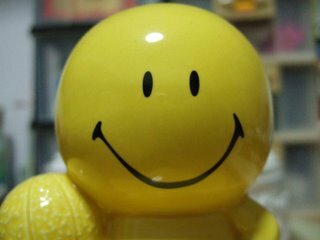 Very good! The sea cucumber didn't come across as too gelatin or slimy, which upped the appetising factor (for me at least). 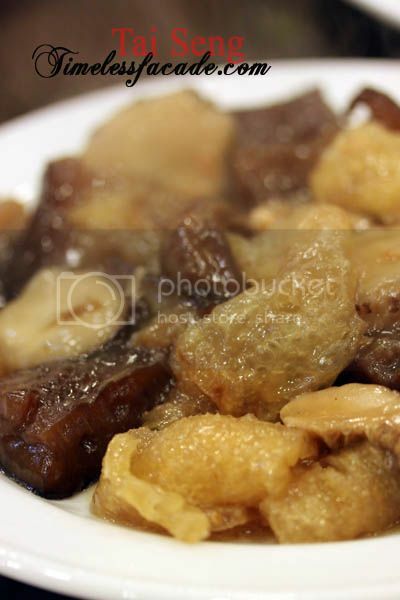 Coupled with mushrooms and fish maw that didn't gross me out by being too slimy, it was simple yet good. One of the few yardsticks I use to measure Teochew cuisine and also one of my personal favourites, the goose failed to make the cut, to say the very least. It had a rather gamy taste and did seem a little dry. What piqued my interest was the inclusion of the neck, something which I rarely see nowadays. But its just a mere novelty. 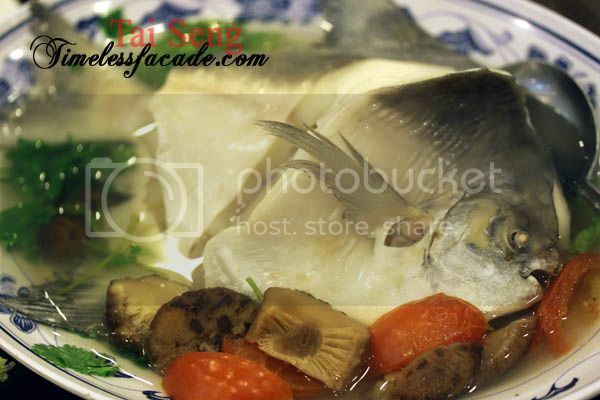 Teochew cuisine is famed for its steamed pomfret, which is steamed with mushrooms, tomatos, sour plums and the likes. 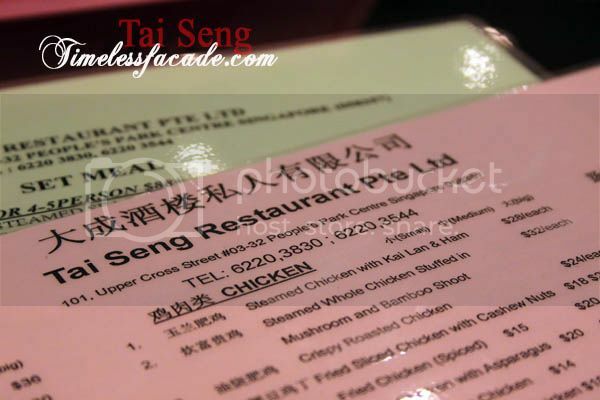 Tai Seng's rendition was excellent if I may say. The rather sizeable fish was very fresh, sweet and steamed to perfection. The gravy was nice and light and complemented the fish very well. My other yardstick for guaging Teochew food - the humble yet labouriously intensive to prepare, yam paste aka Orh Nee. 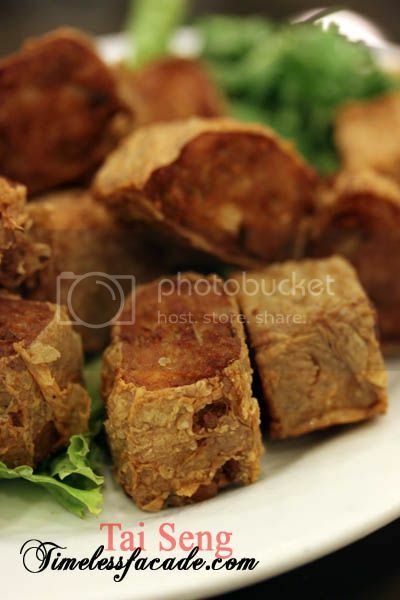 Besides being a little too sweet for my liking, the yam paste lacked fragrance probably due to the reduced usage of lard. At least it was smooth and definitely palatable. 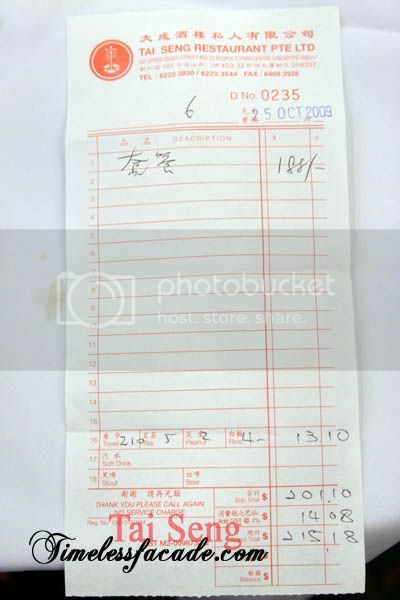 $216 for a dinner for 7 is relatively value for money considering the food that we got. Quality of food is a case of hits and misses and service is patchy but decent. 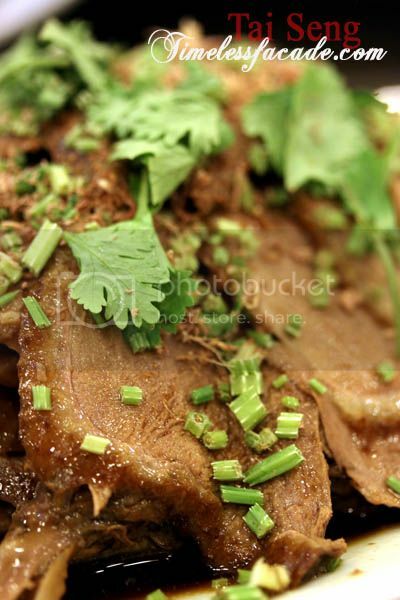 Overall a decent place to try if you want Teochew food and are looking to avoid the crowds in the other more popular Teochew restaurants like Huat Kee and the likes. I heard there's health hazard eating duck & goose neck coz of some chemicals they inject into these animal parts. Not too sure but heck, I like the necks too. Really? I didn't know they injected chemicals.. Anyway I don't eat the necks so doesn't really affect me much haha. 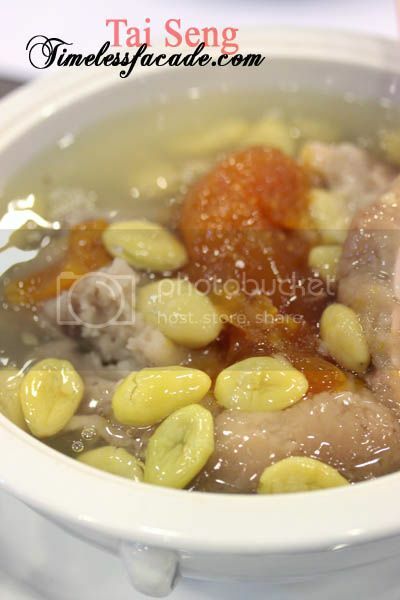 but the or nee looked nothing like the usual, creamy version from the other Teochew restaurants. the one at Formosa @ SS2 is very good. J2kfm: Are you referring to SS2 in KL? I think I have been to Formosa before..